With its 38 participants from southeastern Minnesota the juried exhibition “Locavore” was quite a big show and, also, my first time at the RAC. It was actually a double event as “Locavore” shared the same floor with another exhibition titled “Homegrown”. Two of my works, “The Hut On Fowl’s Legs – Baba Yaga” and “Starwalker – A Postcard To Buffy Sainte-Marie” were accepted. Having a work for the first time on public showing is always a special time for me so hearing that “Starwalker” was one of the works accepted made my day. The turnout for the opening ceremony was very good (I overheard comments of the visitors not seeing such a big crowd at RAC for a long time). Again, it was a great opportunity to meet some of my friends and colleagues as well to see some new faces and works. For this year I had a digital work titled “Hope”. There seemed to be more artists and more visitors this year. The show was set in the Hage Atrium of Mayo’s Siebens Building. I liked the setting and enjoyed seeing some nice artworks and talking to participants and guests. Like it’s last year’s predecessor this was an quite ambitious event. From the poster (with the Mayo brothers with scarves over their faces) one would learn that on June 21st in the Salon and it’s surrounding bloc from 3 pm up till midnight there will be more than 20 musical acts performing on 7 stages, 50 + visual artists, poets, filmmakers, dancers and much more. The weather was good and the atmosphere was one of a carnival. The artists had an option to exhibit in the Salon or outside. I opted to hang my stuff inside. For this purpose I decided for four pieces: two old and two new ones: “Bucolic Fantasmagoria – That Moment” (digital print), “Incredible Daydream With a Painting Box” (acrylic on canvas 40” x 30”) and two versions of “Hope” (digital prints). As we were pretty much squeezed inside I had to stack my works in three rows one above another. The turnout was good although some thought it was not as big as last year. Anyway I enjoyed being there, rambling around, meeting people and taking pictures. This was an obscure event with a lot of strain between some involved in its realization. It was John Patrick’s show; he invited me and several other artists to support the show with our works. I brought in the prints of my oil paintings “Baba Yaga” and “Downtown Fortress – Red and Blue”. Some days we would just come, sit and talk; other times some people would bring instruments and play music. There was a lot of talking about closing of the Salon. Symphonic Vision was a quite spectacular event. The idea was to visualize the concert of Rochester Symphony Orchestra and Chorale by adding to it an art exhibition, overhead video containing the details of the paintings, visual effects called Symphonic Vision by Kevin Dobbe and even two dancers. The Saturday was the main day of the event, it was evening show, and the turnout was just great; Sunday was an afternoon show with somewhat less visitors but still a very good turnout. The visit to the gallery was arranged for one hour before concerts, during the intermissions, and after concerts. During the intermissions there were so many people who wanted to see the exhibition that they had to form two lines to get inside and one going out from the Black Box gallery. It was great to see my colleagues happy with the show. There were so many compliments and questions asked about the works. And, yes. It was a very special feeling seeing our works above on the big screens moving in all directions. Coincidentally my two paintings covered the last two movements; the monumental Gate perfectly fitted equally monumental finale. My wife Dubravka and I have taken a bunch of photographs of the entire event (except the concert as photographing during the performance was not allowed), and the film crew was filming the documentary about the show. They promised to give us both copies of the video part of the show and the documentary when finished. In September 2014 I accepted an invitation to participate in the abovementioned show. The theme for the show was centered on Mayo Clinic values. Another requirement was that the art pieces shouldn’t exceed 30” in size was somewhat restrictive for me because it excluded some of my oil paintings. Having that in mind I opted for a digital work titled “Gonda As An Afterthought #1”. The work was inspired by one of the most attractive Mayo Clinic buildings in downtown Rochester. The work itself is a kaleidoscopic architectural fantasy with the elements of the Roman architecture modified and superimposed to the image of the Gonda Building. November 11th was the artists’ reception day and a chance to see the entire show and talk to the artists, visitors and organizers. The feedback was very positive and it was fun to meet some people that I had never seen before. I accepted the call from “Crossings at Carnegie” gallery form Zumbrota MN, to participate in their now already traditional “Poetography” event. This time it was “Poetography VI”. The idea is to put together visual artists and poets; the photographers turn in their works, and the poets pick those they like and write poems inspired by the photographs. I printed my “Ancient Evenings” on a wonderful high quality “watercolor” paper that was a great match for the picture. My work inspired Mrs. Delia Ralston from Waterloo, Iowa to write her poem “Artichoke”. The organizers had put together a book containing all the works: the photographs and the poems. The “Poetography VI” culminated with the reception for the photographers and poets at the Crossings At Carnegie and the Zumbrota movie theater where the poems were told and the pictures projected on the big screen. The place was packed with the visitors and I had a chance and pleasure to see many poets and photographers. Here is a bunch of pictures that my wife Dubravka took during the event. The works were on the show until October the 4th and after that the ”Crossings” staff told me they would like to keep my picture on the show ever further. It is still there. Sometime in May 2014 Patrick John and Bill Laabs have told me they were preparing a show at the Salon with the idea to present the cycle of Orpheus based on the Greek myth and its reception into some of the world religions including Christianity. They asked me to take participate in the show with a few works, and I said yes. After browsing through the works that I had at the hand they both strongly opted for my two oil older paintings resembling the Byzantine icon stile: “Little Jesus” , “Archangel Michael”, and a digital work titled “Bucolic Fantasmagoria”. I hanged the paintings on the said place and, frankly, that was where my participation ended. At the show I realized that the organizer succeeded in bringing a whole group of artists on board. Bill and Patrick were satisfied how the show did go, and I was glad to help them and to show my works. The show was well visited and there was live music through most part of the night. Soon after “Exposed” the next “Ex” to come was “Explosion” or, more precisely: “Art Explosion”. I accepted the invitation without any hesitation knowing I had had enough material to show. For this show I decided (unlike on the previous show where I came out with photography works only) to present some of my painted pictures. Also, like in “507 Exposed” where the topic was architectural, I decided to stay in some way with the architecture as an element that would connect the works to be presented, so I picked five paintings mostly unrelated to each other (with an exception of “Moonways” and “The Sister”) loosely connected by the fact that each of them had some architecture presented as it’s essential part. In addition to already above mentioned oil oil paintings I put in another oil painting titled “Red and Blue: Downtown Fortress” as well as two acrylic paintings – “Brown and Blue” (from the series “Highway 63”) and “Artists in the Bridge”. As always in the Creative Salon” there were some musicians to be involved (Moxie, 1422 and Glow Mechanics) as well as some poets who were to join their forces to some 25 visual artists. I had great expectations to see many of my colleagues and some of new faces at the opening. Unfortunately the thins didn’t go very well for me; for two days just before the show I’d been having serious problems with my stomach (doe to a flue bug that was taking its toll those days around the place) that I was not able to go to the opening of the show. However, eventually my sickness improved and around 9 pm I was in the Salon. For some three hour that I spent there I was able to talk to some people and to take some pictures, but of course, this report is not complete as it would be if I were there for the opening. Although the pieces that I put on this show have different topics, were executed in different techniques, and times there is one thing that they have in common – the architecture. Not long ago in this very place we had a photography exhibition (“507 Exposed!”) in which I presented a series of photographs and they all had one topic – the architecture of Gonda Building in downtown Rochester. Echoing that idea I decided to stay, in a loose way, with similar thinking – thinking about architecture but unlike the photography show where everything was about architecture and architecture only, here there is a variety of “stories” presented. The presence of architecture in each of these paintings gave me a formal excuse to put them next to each other – after that most of similarities disappear. “Moonways” and “The Sister” are the only two from the group that are closely related to each other being, actually, a pair – almost siblings. I painted them after spending a vacation in Rovinj – a Mediterranean town in Croatia a few years ago. “The Sister” is also, in some way, a self-portrait. “Brown and Blue” is an acrylic painting and an example of typical American architecture – actually a two-color study of pretty recognizable Oak Center on Highway 63. “Downtown Fortress – Red and Blue” is a vision of downtown Rochester as a fortress. Here, again, there are two dominant colors defining the image. “Artists in the Bridge” is another acrylic painting with an example of a vanishing American architecture; it shows an art exhibition in the Zumbrota’s Covered Bridge. More than six hours of art, loud music, chat and, well, some wine. As always that was a good combination to attract visitors. Due to some other events that were happening in the city the place was not as packed with people as it was during my previous show here, but there were enough visitors there to make the event interesting. For me it was another chance to show my art and see some friends and colleagues. This time I came with seven pieces inspired with architecture or, to be more precise, with the architecture of the Gonda Building – one of the buildings of the Mayo Clinic in downtown Rochester. I’ve got a lot of positive feedback and was really satisfied with many comments that I heard about my work. People from ReVerb asked me for an interview and during that meeting I had a pleasant chat with the crew. Here is a link to the video (my interview starts at around 10th minute). I always had a strong interest for architecture – especially the urban architecture. Elements of urban architecture are present in many of my works. However, this time architecture is not just one of the subjects but the o n l y subject of the works presented. My interest in these pictures was concentrated to the Gonda Building of the Mayo Clinic in Rochester MN. I made a series pictures on the topic and here are a few samples of that series. The Gonda is a fascinating building; it keeps attracting many photographers and many wonderful pictures of the building being taken witnessing its beauty and its glory. This time my intention was not to make documentary pictures of the building, but rather, its architectural elements were a trigger for my imagination to stretch beyond the obvious. The freed imagination allowed itself to stretch in time and space producing in the process the multi-layered images that often have almost a kaleidoscopic quality. I always take a close attention when giving titles to my works. This time there were some working titles such as “Open Scene”, “Global Worming in Rochester”, “Gonda Arena”, “Double Gonda”, etc; also there were certain variations of a picture to which title I would just add number such as “Double Gonda #1”, #2, etc. Finally, in the end I decided – for this purpose – just to leave the pictures without titles as visual sensations undisturbed by any explanation. I accepted an invitation by the people from Rochester’s Salon and reVerb to participate in the multi-media event that attracted more than 40 visual artists, five poets and five groups of musicians. It turned out to be a very successful show that had a great turnout. It was a wonderful opportunity for me to meet many new faces and also some of my dear well known friends and colleagues. It felt so good being among all those enthusiastic, talented people. Had a chance to see some very interesting works, the live word of the poets and good music. For me it was an opportunity to show my two newest oil paintings as well as two earlier digital works. The paintings’ titles were “The Golden See” and “African Dream” and the other two were “Digital Return of Ship of Fools A and B”. People from Rochester’s Choral Art Ensemble came with an idea to invite visual artists to participate in two of their events and bring their works that were inspired by or related to music. Their two concerts were accompanied with several videos as well as paintings and drawings. It worked pretty good. I had my three older works on the show (acrylic painting “Incredible Daydream with the a Painting Box”, and two digital works -“Sunny Afternoon” and “Angel”. These photographs are from the second concert the one in Rochester Art Center. Let the idea for this show be explained by the very words of the people from Crossings Galery: “Stolen Goods, is a group show featuring artwork inspired by Old Masters, but modified to reveal the actual artist’s own truth.” As soon as I’d received the invitation for participation I already had a coupe of my works as potential candidates for the show. Eventually, I picked up my “Ship of Fools – Homage To Hieronymus”. The idea for the painting, obviously, came from the oil painting with the same title by one of my all time favorites Hieronymus Bosch. I painted it, as one of my first oils in the year 2007 while attending my first painting class at the Rochester Community and Technical College. The picture was on several shows, I liked it much, but there were some details that had always bothered me such as little white unpainted spots and other minor irregularities. Finally, in the beginning of this year I’d repainted the picture fixing the mentioned problems and also painted the sides of the canvas. In its essence and the detail it is my old painting. Thursdays on First is an already traditional manifestation in Rochester. People come out with whatever they want to show or sell; musicians, food sellers, artists, artisans and visitors mix together celebrating togetherness. My friends from IMAA (Intercultural Mutual Assistance Association) invited me again to join them to show some of my works and also present some of digital techniques on my laptop. I decided to show five of my older digital works: “A Bucolic Fantasmagoria – That Moment”, “Angel”, “The Pan #3”, “Tea Table” and “Sunny Afternoon” which we posted on the sidewalk. I was surrounded with young people from various countries guests of IMAA who were also presenting their skills and products. It was an easy going afternoon; I even had time to move around and take a few pictures. IMAA also provided a poster for my presentation. In the spring of 2012 I received an invitation from “Crossings” gallery to participate in the show titled “On the Edge”. It was a group show in which the participants were asked to bring one of their works that would correspondent to the mentioned title, and it turned out to be 25 artists show. Without much hesitation I decided to go with my oil painting “I Had a Dream – A Nightmare” that I painted the previous year. It is somewhat a scary picture not intended to make people smile and enjoy it the way they would enjoy a pleasant landscape or a still life and I didn’t expect that everybody will like it. However, it turned out to be quite popular: people in the “Crossings” liked it and decided to put it on the poster of the event, and also it appeared in the Rochester’s “Post Bulletin” accompanying a short article about the show in “Crossings”. The opening reception was on July 13 and it was another opportunity to see some people I already knew, but also some new faces too, and of course, to enjoy watching the artworks. Rochester’s Intercultural Mutual Assistance Association (IMAA) had organized the celebration of World’s Refugee Day at Rochester Community and Technical College on June 16th, 2012. They invited me to join the celebration and bring some of my works. I decided to put on the show five of my recent oil paintings. It was a good chance to present my new painting “The Sister – Mediterranean Sundowns”. The program was good as well as the turnout. The people from IMAA designed a separate poster for my part of the show. Before the opening there was a huge rain – me and my son Petar, who was helping me, got wet, but the pictures reminded dry being safely wrapped in the plastic bags. In October 2011 I received an invitation for participation in a show at Rochester’s Barlow Event Center. The call had come at right time for me: I had a few new works and I really wanted to show them. The Center has a reputation of organizing musical concerts and this was for the first time they organized a visual arts event (with an intention to continue in the same trend). In the local papers the event was described as one of bringing “some of the area’s finest artists ranging from painters, sculptors, photographers and crafters”. Most of the artists (some 20 in number) came from Rochester, but there were also artists from Minneapolis and other places. The 26 pictures that I came with were both paintings and digital pieces. Among the new ones were “Moonways”, “The Beasts”, “Nightmare” as well as some older such as “Ship of Fools”, “Brown & Blue”, “Mondrianesque Composition with a Totem” 1 & 2, “Downtown Fortress”, and others. Refreshing for me was the show’s great diversity. I enjoyed the opportunity of seeing some new faces and their works as well as the pleasure of seeing some old friends of mine. During this year`s Plain Air in the Zumbro I was visiting my family in Europa and did not participate the event in person. However, I already had a painting covering the given topic (anything about the Zumbro and Zumbrota). It was my oil painting “Joy of Art” with the theme of our before mentioned show at the Covered Bridge” in Zumbrota. Marie of the “Crossings” was glad to accept my work, and it is still in the gallery. Made my first contacts with “Crossings” gallery during my previous shows in Zumbrota (Covered Bridge show and Plain Air in the Zumbrota). Marie Louise Marvin, the owner, visited the Covered Bridge show, talked to me, and liked my works. Eventually, I submitted my portfolio and we were in touch trough e-mails, Facebook, etc. When, in the summer of 2009, I finished my oil painting titled “Let’s Go and Read Something”, I send its photograph to “Crossings” and, again, they liked it. Soon an offer for a show followed. “Crossings” Gallery has a long tradition of presenting two artists in a single show. This time they wanted to present my works together with those of Mary Solberg from Winnona, WI. I liked the idea. The exhibition was scheduled for February 25th through March 26th 2010, and I had enough time to paint a couple more pictures (“Downtown Fortress – Red and Blue” and “Incredible Daydream with a Painting Box”). On he show I had eight paintings (“Ship of Fools – A Homage to Hieronymus”, “At the Edge of a Dream”, “Brown and Blue”, ‘Three in One”, “Artists in the Bridge”, “Let’s Go and Read Something”, “Downtown Fortress”, and “Incredible Daydream With a Painting Box”), and seventeen digital works (“Mondrianesque Composition With a Totem # 1”, “Mondrianesque Composition With a Totem #2”, “Tea Table” (big), “The Pan”, “Cup of Tea, Variation #6”, “A Bucolic Fantasmagoria – That Moment”, “Apples”, “Cup of Tea, Variation #4”, “Runner in the Box”, “Sponge Bob Attacks My Window”, “Oak Center, Minnesota”, “Red Angel”, “Tea Table” (small), “White Angel”, “Sunny Afternoon”, “Horses”, and “Cosmic Gamble”. The show was successful: the turnout on the opening reception was very good (I had a great pleasure to see many of my friend, colleagues, teachers, as well as some new faces), the setting was good, the response of the viewers was very positive, there was an article about the show in as local newspapers, and my two works were sold that evening. I finally met Mary Solberg in person and talked to her about her art, commented some of my works, etc. At the closing of the show Marie Louise told me it was one of her favorite shows in last year and a half or two and she wished to keep some of my pictures on the show for an extended time. She picked her seven favorite pictures and we agreed to leave them on exhibit for next couple of months. 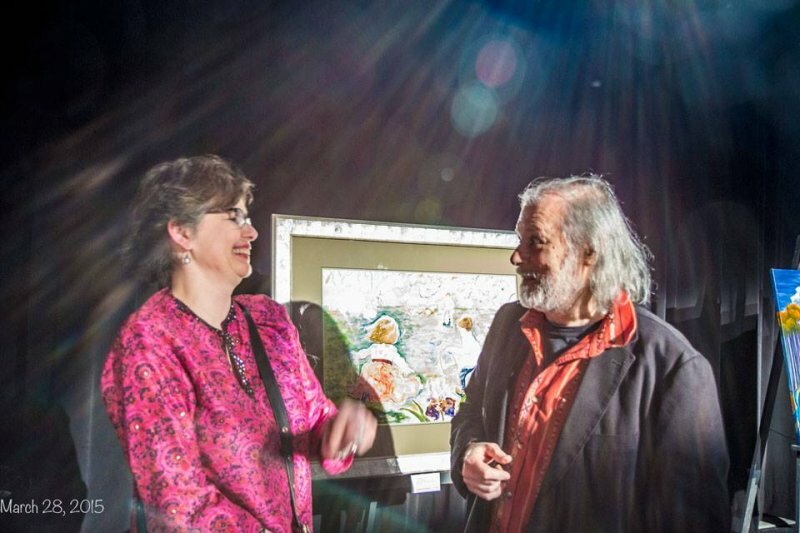 Not long after the show at the Covered Bridge “Crossings” gallery of Zumbrota organized an event titled Plain Air in the Zumbrota, described as “Paintings that celebrate Zumbrota`s historic Covered Bridge and the Zumbrota River region”. Artists were invited to spend two weeks (June 15-30, 2009) in the area, and do some open-air paintings on the given (although very widely defined) topic. I came up with an idea to paint an event rather than just a landscape or architecture. The event was our previous show at the Covered Bridge. It was an acrylic painting executed in somewhat surrealist manner. I didn`t get any material rewards, but I had that satisfaction to have a picture unlike any other on the show and also I was glad that people of “Crossings” liked it. “Artists in the Covered Bridge” was on the exhibition in “Crossings” gallery for a month or two, and after that (courtesy of “Crossings”) the picture was on the show in Zumbrota`s City Hall for next few months. This was one‐day show and another requirement for my final semester in School of Fine Arts of University of Minnesota. Supervised by our instructor Betsy Hunt my classmates Brenda, Connie, Yuko and myself were exploring possibilities of using alternative spaces for our show. Everybody liked my idea to pick the Covered Bridge in Zumbrota. Unlike my colleagues who exhibited photographs, I decided to show my computer art, digital photograph as well as my paintings. Finally, I’ve got a chance to present my oil painting “Ship of fools”. The show was a real fun for all of us: the weather was fine, the atmosphere was relaxed, we had some important visitors, and we even had time to play soccer a little. “Facing” was my first individual show, and my best so far. Performing my own exhibition was a requirement for my senior year at UMD and I took it very seriously. Finally, I had an opportunity to do what I really wanted, to decide what and how many works to show and, there were no jurors. My mentor Betsy Hunt suggested me to present my digital works, and I agreed – I had a good concept and enough material to choose from. I designed an attractive poster and a post card, put my portfolios together, wrote an artist statement, got my prints done, and the event announced. My wife Dubravka and sons Gordan and Petar helped me to put the show up, my instructor in drawing and painting Simon Huelsbeck was so kind to prepare an opening speech, and my colleague Yuko Hibino took over the camera to document the opening. The exhibition was a success: the turnout was great, many visitors left comments I was touched with and proud. The reactions were very positive. At the end the UMD staff allowed me to extend the show till the end of the semester. The year 2009 was my final year at the college, and it was a very dynamical one: I took seven classes at both RCTC and UMD, had to prepare my own exhibition, worked two part time jobs, had family shores … My exhibitions in this year started with the RCTC show. I knew in advance that the jurors were inclined towards ceramics and photography; however, I decided to put the stress on my paintings and computer art (despite the fact that I had some strong material in black and white photography). I submitted my “Premonition of a Potential Cosmic Procreation – The Rock” in a large format, my study in the Byzantine art – oil painting “Archangel Michael”, end a version of my black and white photography digitalized and converted into inkjet print titled “What is in Your Mind, Petar ?” in a large format. The jury accepted ” The Rock”. The selection of the paintings was disappointingly mediocre and, in my opinion, hardly one could match my Archangel. I also think my third picture deserved to be presented there, and it must have been its big format that was the reason for its refusal. Despite some great ceramics pieces the show lacked a real conception. Anyway, for me it was just a sideshow as I was already preparing my own show at UMD. About at the same time as the annual show at the RCTC there was another show at the UMD. At that time I wasn’t UMD student yet (I started there in August). But I was allowed to participate as a future student. The show was prevailingly photography and design show (actually I was the only painter there). I submitted four pieces: freshly refused from RCTC exhibition Ship of Fools and Little Jesus, as well as a detail from Digital Return of Ship of Fools, and Brown & Blue. I remember the show as one of low energy, poor lighting and clumsy settings. My second show, I submitted my big oil painting “Ship of Fools – A Homage to Hieronymus” (which was at that time my best work and high expectations about it), a piece of so called computer Art ” A Bucolic Fantasmagoria – That Moment” that was another ambitious piece, as well as a small oil painting titled “Little Jesus”. The jury accepted the Fantasmagoria leaving me with mixed feelings. I was proud of the Fantasmagoria, but the Ship not passing through was a major disappointment for me. However, That Moment was a success, as I heard many positive comments from the people who saw it. This was my first exhibition ever. At that time I was a student at RCTC. Among other classes there I had Painting I with Simon Huelsbeck as the instructor. Each student was allowed to turn in up to three works. I submitted two oil paintings that I painted that semester (At the Edge of a Dream and Self Portrait), and a charcoal drawing (Still Life – Drapery). The jury accepted the first two mentioned. It was quite a success for a beginner.